In the third exercise of the studio we will elaborate a program and design a domestic space for an active elderly or young-old. We will design a speculative habitat that will fit someone’s particular lifestyle. Let’s forget our clichés regarding dwelling projects, and the automatic responses on how a home must be: the typical repetitive set of rooms containing specific functions such as kitchen, bathroom or bedroom. Let’s challenge our preconceptions by studying first a specific person, then designing a habitat that fits that subject. Each student will select a person that will be his or her client. Therefore it will be necessary to study the needs, everyday life and habits and what could be the present and future needs and lifestyles for such client. 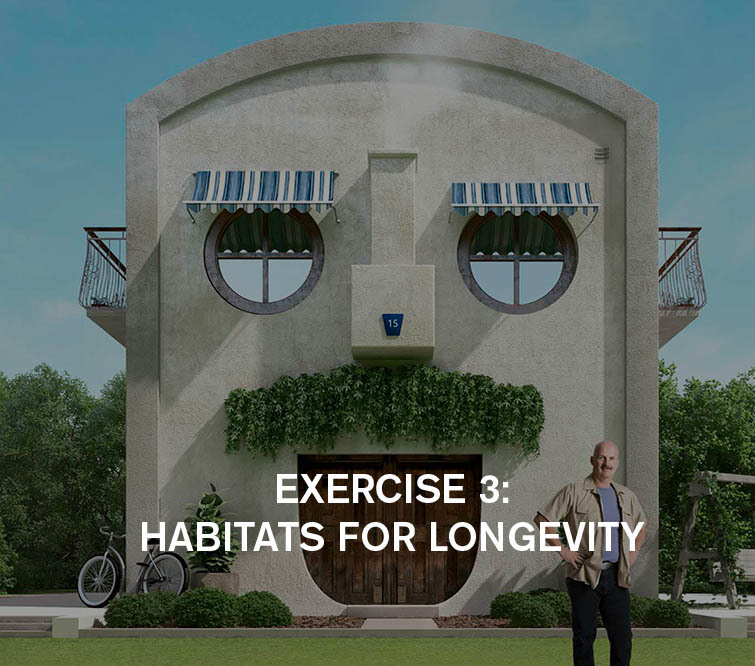 The research done so far, a collective logbook on longevity, will be also present in this exercise (and the rest of the studio! ), so diverse concepts, experiences or technologies mentioned in this research shall be integrated in the project. Then it will be the time to turn that study into a set of spatial needs. Only then we will start formalizing, giving specific shape to our habitat project. We will try not to start by a preconceived architectural form but some unexpected form that comes out of a process. Networks and relationships. Links and bonds with other individuals that might or might not live with our client. Objects and Technologies. Belongings, tools, objects of affection and techniques necessary for the client’s activity. Cycles and times. Timelines linked to the client’s activity, rhythms, and durations. Select a minimum of 3 items (concepts, technologies, experiences) contained in the longevity logbook. Based on the former, build a program for the client: a set of necessities, experiences and related spaces.